Congress wants the Agriculture Department to rethink its healthy school lunch proposal: it's just too good. 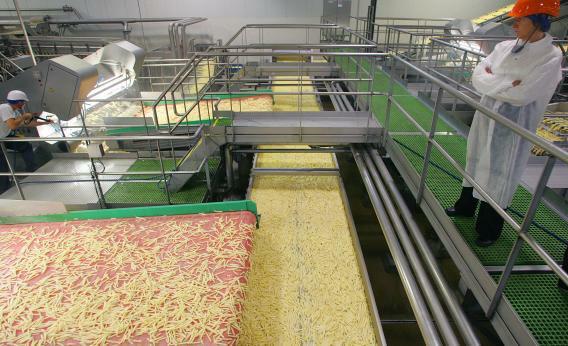 Frozen french fries roll off of a conveyor belt. Last year’s Healthy Hunger-Free Kids’ Act required changes to the school lunch program to make it healthier (and to lessen the overall federal subsidy). What it didn’t do was define exactly what changes would achieve the goal of better nutrition. The Department of Agriculture created a proposal that fit within its budget and pleased nutritionists, public health experts and many school lunch officials, but it didn’t please the American Frozen Food Institute or the companies that provide much of the food served to kids at lunch—companies like Coca-Cola, Del Monte, and the makers of frozen pizza. According to the NYT, those companies have spent $5.6 million in successfully lobbying their congress members to object to the guidelines. Their request to the USDA Go back to the drawing board, and don’t come back until you have a proposal that accomodates the health of our most important constituents: the ones with deep pockets.